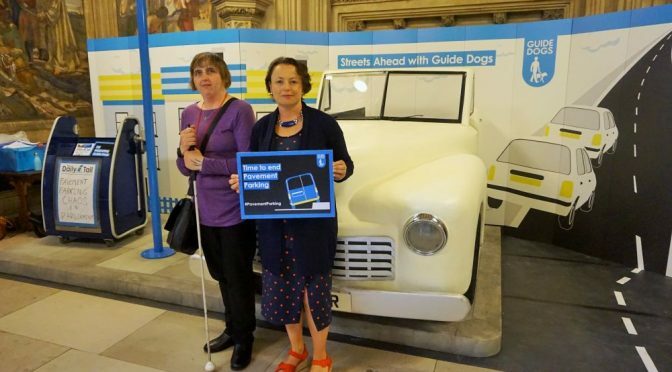 Newcastle North MP, Catherine McKinnell, has met up again with the charity Guide Dogs in Westminster, to hear the latest about their ongoing campaign on the challenges that people with sight loss face when walking the streets. The Tyneside MP visited a street scene set up by Guide Dogs in the Houses of Parliament, during which she dodged a pavement-parked car, stumbled across a variety of street clutter, and visited a ‘shared space’ area lacking in safety features such as kerbs and pedestrian crossings. Catherine also heard from guide dog owners that dealing with such obstacles can leave them scared and reluctant to go out. According to a Guide Dogs survey, 97% of blind and partially sighted people have encountered obstacles on the pavement. The most common obstacles were cars parked on the pavement, with 9 out of 10 having had problems with pavement parking. Pavement-parked cars force pedestrians into the road to face oncoming traffic. This is particularly dangerous for people with vision impairments, parents with pushchairs, wheelchair users and other disabled people. In separate research by YouGov for Guide Dogs, two out of three drivers (65%) admitted having parked on the pavement and nearly half (46%) were confused by the law on pavement parking. Guide Dogs is campaigning for a law to make pavement parking an offence, except on streets where local authorities agree that it is safe for pedestrians. This is already the case in London, but elsewhere across the country, councils struggle to tackle unsafe pavement parking. ‘I know from my work with both Guide Dogs and the RNIB in Newcastle just how challenging getting out and about independently can be for people affected by sight loss – not least having undertaken blindfolded walks and bus journeys in Gosforth, Lemington and Throckley. ‘That’s why I’ve regularly lobbied both the Government and local services on issues such as pavement parking, street clutter and shared space, having experienced these problems at firsthand. ‘I am determined to continue to do what I can to make life easier for people who are blind and visually impaired and, in doing so, for all other vulnerable pedestrians and road users. ‘Too often, our streets can be cluttered with dangerous obstacles for blind and partially sighted people. The worst offenders are cars parked on the pavement. If you have a vision impairment, pavement parked cars aren’t just a nuisance, they can force you to step out into the road and put you in real danger. Outside London, the law on pavement parking is unclear and difficult to enforce. We want pavement parking to be the exception so pedestrians can rely on their path being clear. When drivers themselves don’t know the rules, that is a strong sign the law needs to change.